Sleepy puppy, sleepy kitty! They are so sweet as they snooze together. 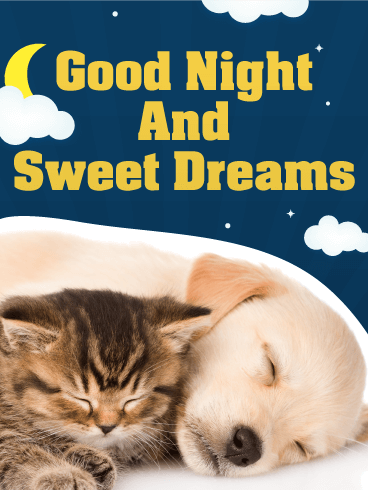 Send this good night card for sweet dreams and to wish someone a good night. They will feel all warm and snuggly inside just like these two furry friends. Have you ever seen a more precious greeting card? This one has all the feels. We can feel our eyes start to droop, and our head begin to nod already! Good night! Sleep tight! 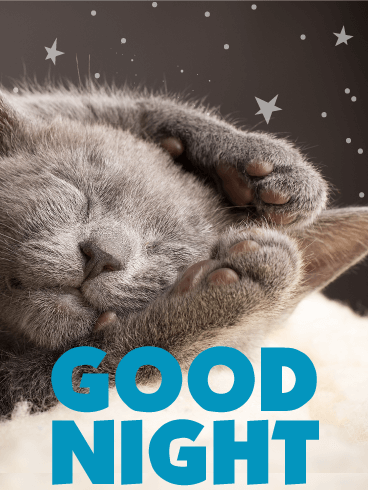 For a purr-fectly good rest, send this adorable kitten card to someone you love. The gray kitten is irresistibly cute with her paws curled around her head. She will have you feeling snuggly and yawning in no time at all. 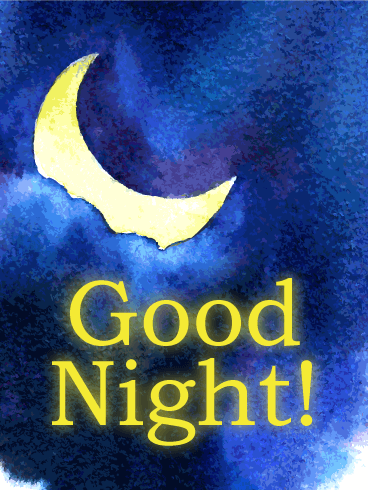 Send a good night card to wish someone a good rest as they nod off to dreamland. Good night, sleep tight, don't let the bed bugs bite! No worries about that here. This tabby cat dreams of catnip and mice. What do you dream about? Send this card to your favorite dreamer and wish them a good night. May we all sleep as adorably and comfortably as this kitten! 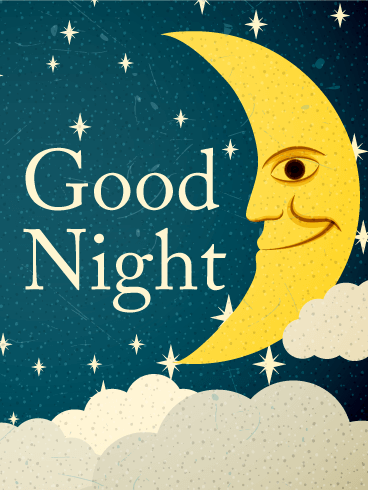 Hush now, close your eyes, and nod off to dreamland with this cozy good night card. When the moon is aglow, to bed we go! May the warm light of moon beams caress you as you fall asleep. This sleepy time greeting card is beautiful painted in soft watercolors. Wish someone a good night with this card full of moon light. To sleep, perchance to dream, wrote Shakespeare. May we all be beautiful dreamers tonight when we go to sleep. Send a thoughtful card to say good night. Do you believe in the man in the moon? Do you believe in your dreams? This vintage-style card wishes the receiver a good night under the starry skies of a crescent moon. With stars like diamonds, and clouds so plump, this good night wish card is too dreamy to resist. Blow a kiss and send a wish to your sleepy-headed love with this extra-special moon light greeting. It's been a long day; it's time to call it a night! A good night! 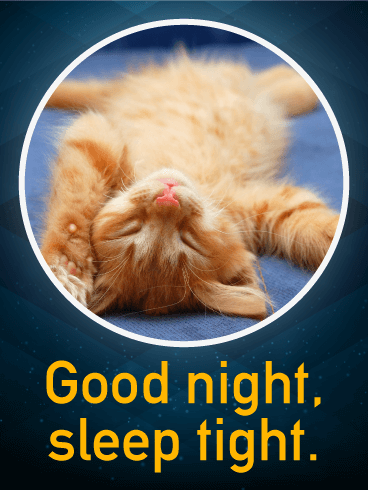 This feisty feline is all tuckered out and ready to wish someone a good night with sweet dreams. There will be more parties and fun tomorrow, but for now we sleep and dream under the stars. Send a good night card to someone special to end their day on a warm note. 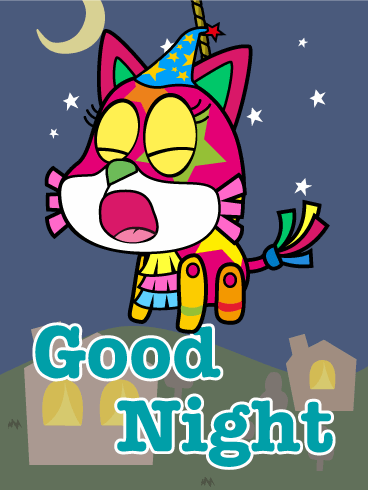 This colorful Cat Piñata card is fun way to say good night, sleep tight!